On March 1, the Middle East Forum revealed that the Silicon Valley Community Foundation (SVCF) has provided at least $330,524 to the Council on American-Islamic Relations (CAIR) and Islamic Relief, two extremist organizations that routinely give platforms to Islamist speakers who incite hatred against women, Jews, Christians, and the LGBTQ community. MEF's Islamist Watch project has compiled profiles and recordings of the worst of the worst SVCF-subsidized speakers. 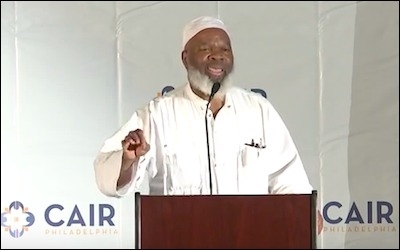 Siraj Wahhaj is a frequent headliner at CAIR fundraising banquets (e.g. Los Angeles in 2011, Philadelphia in 2012, San Francisco in 2014) and a former member of its advisory board. Wahhaj is also heavily involved with Islamic Relief–Canada. Born Jeffrey Kearse in Brooklyn in 1950 and raised a Baptist, Siraj Wahhaj became involved in the black separatist movement in the late 1960s and converted to Islam under the guidance of Nation of Islam (NOI) leader Louis Farrakhan in 1969. 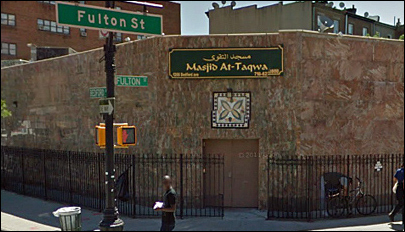 After receiving clerical training in Saudi Arabia, Wahhaj founded Al-Taqwa mosque in Brooklyn in 1981. Siraj Wahhaj has led the congregation at Al-Taqwa mosque in Brooklyn, NY, since its establishment in 1981. Though Wahhaj enjoyed a reputation as moderate over the next decade (in 1991 becoming the first Muslim to deliver a prayer before the House of Representatives), his views sharply radicalized in the wake of the 1990-1991 Gulf crisis, with his sermons expressing extraordinary intolerance toward non-Muslims, women, homosexuals, and others. He is infamous for his 1992 threat to burn down a GLBTQ-friendly mosque in Toronto. In the wake of the 1993 World Trade Center bombing, authorities discovered that Wahhaj and his mosque were closely linked to the attack's mastermind, the recently-deceased Omar Abdel Rahman, and others arrested for terror plots in the New York area. U.S. attorney Mary Jo White named Wahhaj a possible unindicted co-conspirator in the bombing plot. Wahhaj served as a character witness for Abdel Rahman at trial, extolling him as a "respected scholar." Like many other Muslim extremists affiliated with CAIR, Wahhaj has toned down the rhetoric in his public speeches in recent years, but has not disavowed any of his previously-expressed positions. Click the play button at left to instantly hear Siraj Wahhaj say the offending quote displayed at right in his own voice. "The prophet cursed, la'ana, cursed the feminine man and the masculine woman. Cursed... I don't believe any of you are homosexual. This is a disease of this society." "And you know, brothers and sisters, you know what the punishment is, if a man is found with another man? The Prophet Mohammad said the one who does it and the one to whom it is done to, kill them both." "[W]e want our women back to their natural place. What's their natural place? Feminine. Allah made them feminine." "Do you understand what these devils who control the media are doing? ... they're being controlled by Shaytan [Satan]. This society, America, wallahi azeem. America is controlled by Shaytan. American government is controlled by Shaytan. American way of life is controlled by Shaytan. It is. Oh yes, it is. Definitely. No doubt about it." "If you commit zina [adultery] and you're married, the punishment is death by stoning—capital punishment. What you read in Qu'ran is the punishment for fornication, but the punishment for married and committing zina is death by stoning." "The thief, the one who steals, man or woman, male or female, chop off their hands. If they steal, chop off their hands. This is a commandment of Allah, subhanahu wa ta'ala." "We want some guns in Bosnia so the Muslims can defend themselves. ... I'm asking for us to greet the duty for jihad here in America. How? By helping our Muslim brothers and sisters by sending money over there and bringing weapons to Bosnia to the Muslims by any means necessary." "Let us march to Palestine and liberate our brothers and sisters there. But don't stop there. Let's go to Algeria, and liberate the Muslims there. Don't stop there. Go all over the world." "Woe to the Muslims who pick kafirs [non-Muslims] for friends. Woe, woe, woe to the Muslims who take kafirs as friends. Kafir will take you away from the remembrance of Allah." "Take not into your intimacy those outside of your race. They will not fail to corrupt you." Wahhaj played major role raising money for the Benevolence International Foundation, which the Treasury Department designated as a "financier of terrorism" in 2002, ostensibly to aid Muslims in Bosnia.